Beautifully engraved specimen certificate from INSYNQ, Incorporated. This historic document was printed by the Banknote Corporation of America and has an ornate border around it with a vignette of the company's logo. 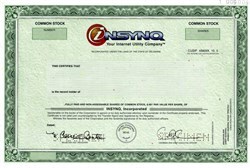 This item has the printed signatures of the Company’s Chairman and Chief Executive Officer, and Secretary and Treasurer. Since 1997, InsynQ has been a premier provider of managed application hosting services and cloud solutions for the small business market. InsynQ provides internet based IT management and hosting services for over 300 popular business applications including QuickBooks, Microsoft Office and Exchange, Goldmine, Sage ACT! and many more. Subscribers of InsynQ services benefit from the customizable desktops and applications their businesses require, while leaving the management of platforms, data and IT in the hands of the qualified professionals at InsynQ.